Every year, the Amsterdam Light Festival hosts an annual light art festival in the Netherlands that presents new and innovative artwork that uses light as its medium. This year's theme is "Existential" and all artists were asked to submit our creative interpretations of the theme and our installation proposal for either the illuminade, which is a walking path full of light art, or watercolors, which are light art along the river. My submission consisted of a conceptual design of the installation along with photographs of my thesis project for my Masters degree in architecture. The light art installation would be a continuation of my research in visual perception and light. Light is an element that envelops us in its embrace, but remains invisible to our eyes. 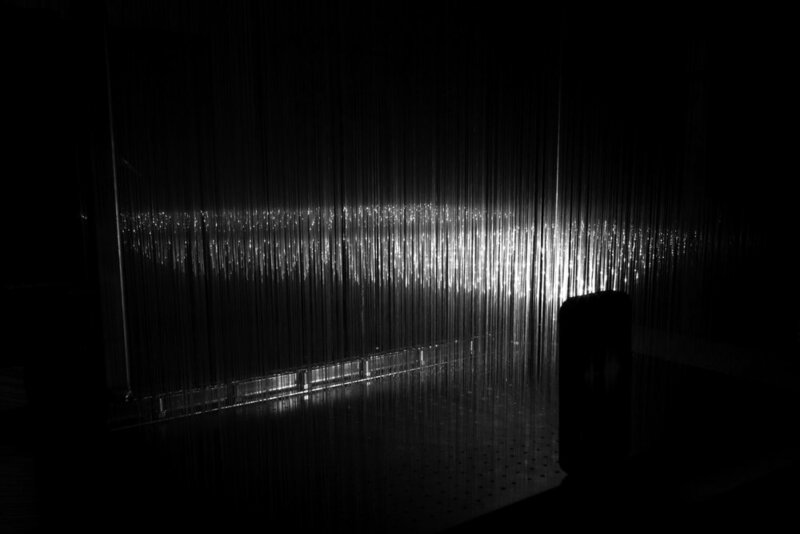 By placing thousands of strands of transparent threads vertically within a half inch of one another, the diffusion of light through this dense field takes on a form that can be perceived by visitors. In fact, the light will appear to move as the visitor walks through the Field of Light installation. No one – children, teenagers, adults, seniors, pets, etc. – will see the same form of light because of their personal height and visual interpretation of the world. Field of Light will give light a visual presence in our world that engages the visitors through personal interactions. Upon entering the Field of Light, visitors will be surrounded by an array of various colored lights diffusing through thousands of transparent threads. The diffusion of light will be visible as a thick plane that begins to curve upwards or downwards as it spreads further away from the source. As visitors move through the installation, the light will move vertically up and down with each of the visitors’ steps. Hence, everyone will have a different experience because of their age, heights, and visual acuity. DMX Lighting will be installed on various posts with timers to slowly brighten, dim, and shut each light off at different intervals. Urban lighting from the Illuminade will also be a part of the visual experience of light within the installation. As an element that is invisible to the human eye, light is often buried in our unconscious mind until we’re surrounded by darkness. Even then, it’s only called upon to help us see the surfaces around us. However, light can be felt as it warms our skin and it can add depth to our world through gradients of shadow. What if light could have a form of its own? What if light could interact with us by moving as we do? Field of light explores this notion through the diffusion of light through a field of transparent threads. The resulting interaction of visitors with the field of light will create both a physical and mental connection between humanity and light. 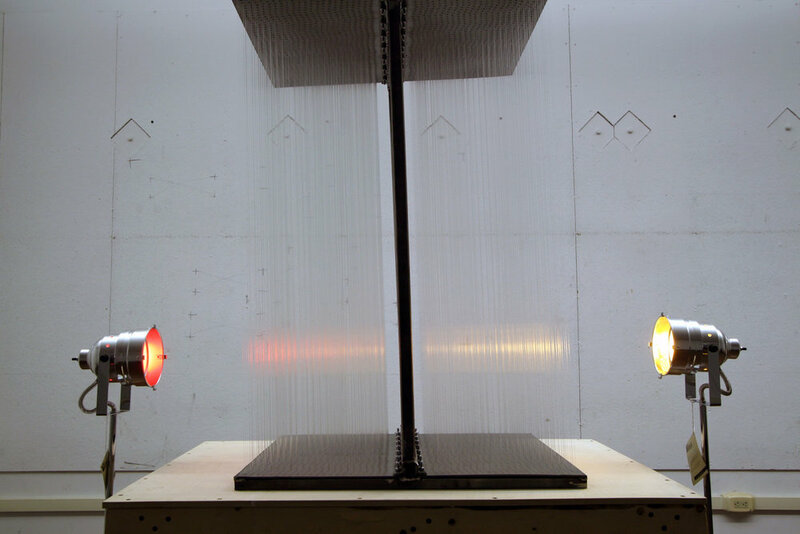 Field of light will be composed of readily available industrial and manufactured components. 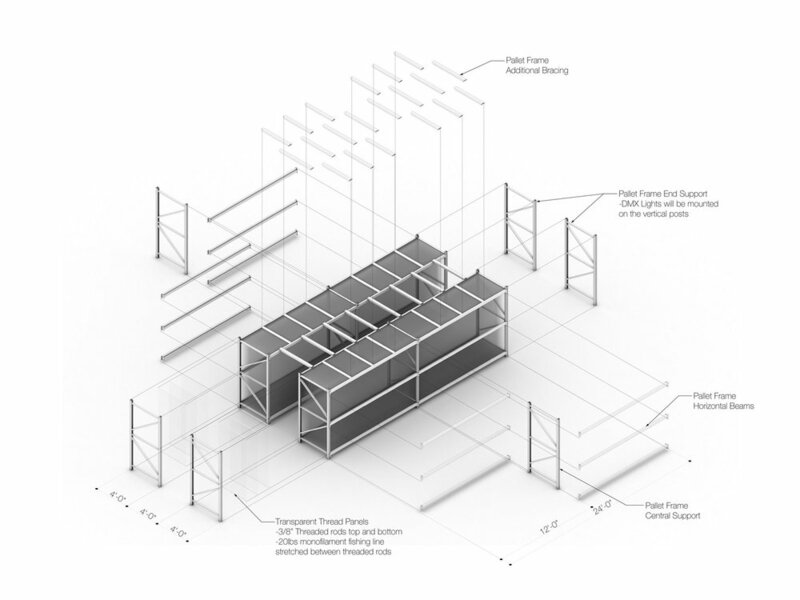 The primary frame will be two industrial pallet racks at 4ft wide, 24ft long, 8ft high spaced 4ft apart to create a walkway between both frames. Clear transparent monofilament 20lbs fishing line will be woven between two steel threaded rods spaced apart at 8ft and held in place with adhesive and weather resistant tape to create a panel. Each panel will be stacked, separated by a large sheet of recycled paper, and packaged in groups. DMX lighting will be installed on exterior posts and directed inward towards the transparent threads. All of these components will be packaged, shipped, and installed on site. The beams of the pallet racks will be located at the bottom and top of the installation, which will ensure that visitors cannot walk into the threads. Field of light will require level ground and two ladders for on-site installation. Platforms for anchoring the pallet rack posts would be ideal in the event of high winds.